If you were ever that crazy kid who aways had a book tucked in a pocket wherever you went, you must read "Compulsory Reading" by Alison Bechdel over at Dykes to Watch Out For. To prove my bona fides as a compulsive reader, I offer this photo of myself at age 6. 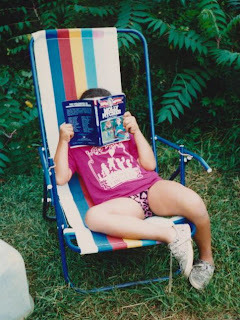 My family was camping on the coast of Maine, and yes, I am wearing my bathing suit and reading the "Childhoods of Famous Americans" biography of Molly Pitcher. My siblings are probably off swimming somewhere. I did get glasses at some point.